Now in their eighth year with German based kit manufacturer Adidas, the new Away top continued the trend of having a white version of the Home kit, with a diagonal lined pattern throughout the material, and the black V neck collar had tangerine and white trim, as did the black cuffs. The three Adidas stripes that used to run down the length of the sleeve were now only on the shoulders. The black shorts and white socks carried on the look of previous kits, with the now familiar three Adidas stripes appearing on both. VG, a chain of convenience stores who had been advertising regularly at Tannadice since the early 1980s, went one step further and became the Clubs first ever shirt sponsors when Eddie Thompson - then working with Dundee-based Watson & Philip who at the time own the chain - brokered a two year deal at the tail end of the 1984/85 season. 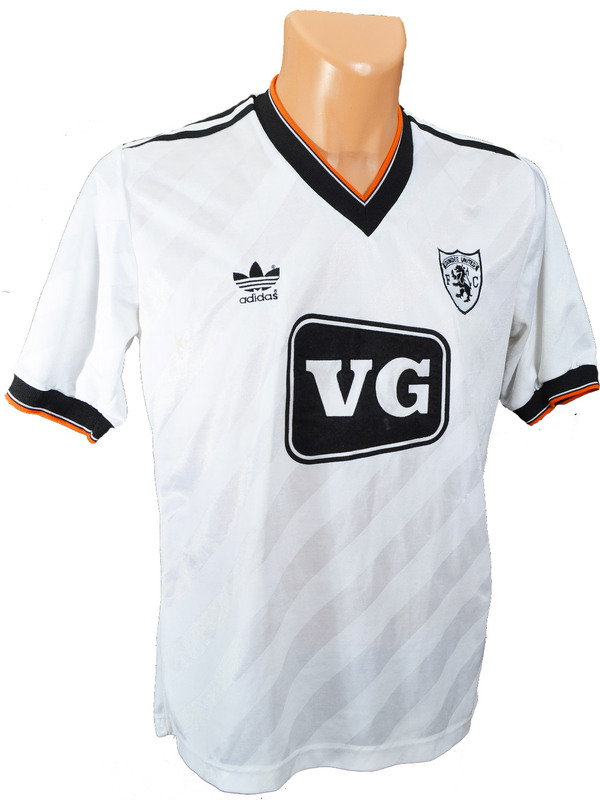 The "VG" Away kit would have made its debut in August 1985, either in the 2-0 win over Alloa Athletic at Recreation Park, or in the 1-0 victory over Motherwell at Fir Park. It was also used in the Away ties in the UEFA Cup against Vardar Skopje and Neuchatel Xamax. The strips last appearance would have been either the 0-1 defeat at Fir Park against Motherwell, or the 1-1 draw with Hearts at Tynecastle as the long hard 1986/87 season came to a close in the lead up to the double header Cup Finals of the Scottish Cup and the UEFA Cup.